This article give you an explanation of each field found at the top of the Order Entry tab. Click on the Order Entry tab. 1. The first field is the Customer field. This is where you will be selecting the customer you want to place the order for. Under the Customer field you will start typing in the customer's name. 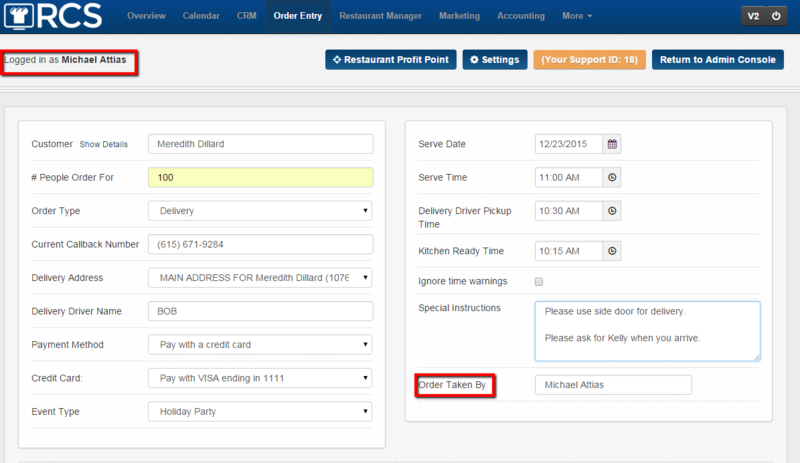 If the customer is already in the CRM then the name will appear in the Drop Down Box. 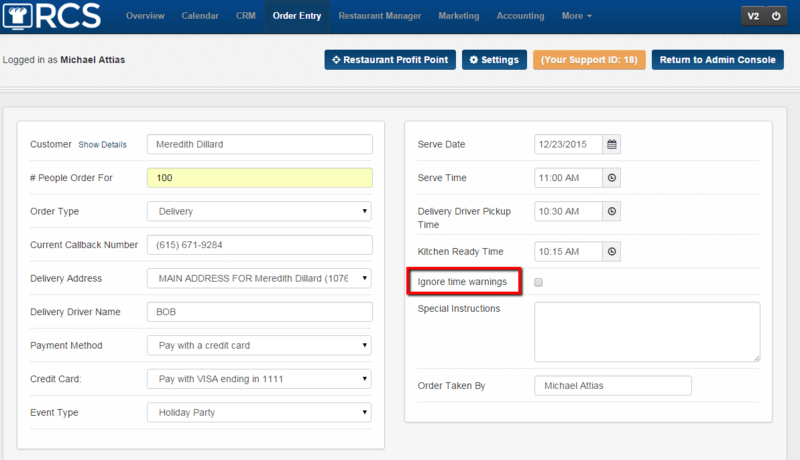 If the customer is not in the CRM tab click on Add New Customer. 2. The next field is the # People Order For. This will be for the total number of people the customer is trying to feed. 3. The next field is for you to choose what type of order the customer is asking for. 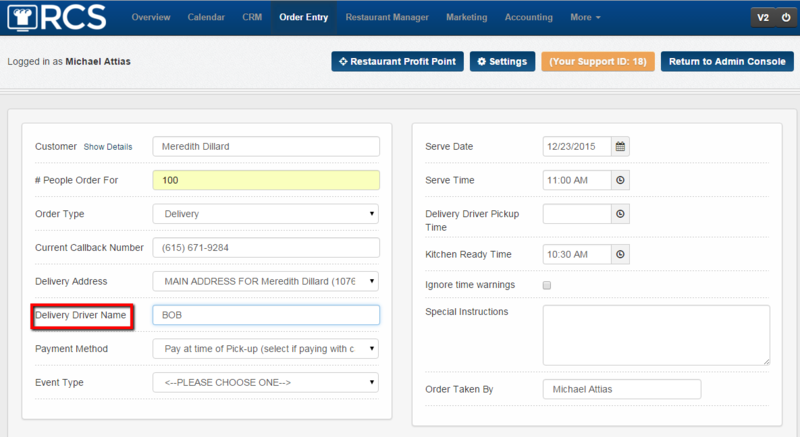 Clicking on the Order Type drop down box will show you the different types of orders your restaurant uses. The standard choices are Pick Up, Delivery, and Dine In. You can add custom order types (ie. Delivery Full Service Catering, Delivery Drop Off Catering). 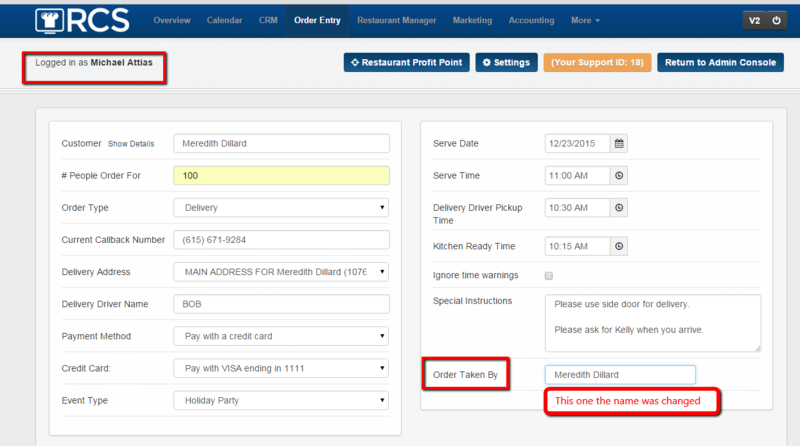 To learn how to add a customer order type please see the article entitled Custom Order Types. 4. The next field is the Current Call Back Number field. This field will automatically fill in if a phone number has been entered in the customer's CRM page. You can always change this number if the customer needs you to call a different number regarding the order. *5. The next field is the Delivery Address field. Please note this field will ONLY appear if the order type is a delivery type of order. If you have chosen Pick Up or Dine In then this field will NOT appear. 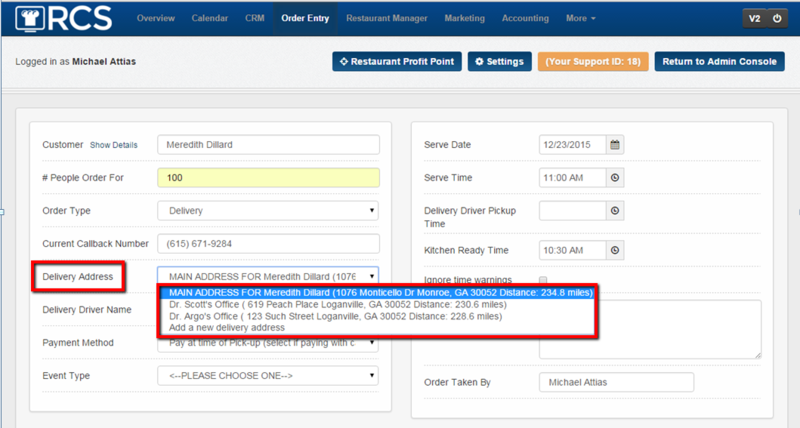 Click on the Drop Down box to see the list of the all the delivery addresses the customer has stored in their CRM page. If you need to add a new delivery address please select Add New Delivery Address. **6. The next field is the Delivery Driver Name. 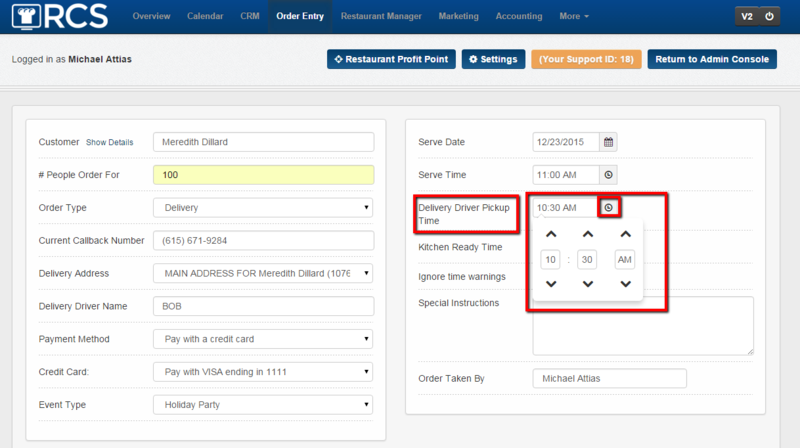 Once again this field will only appear if the order type is a Delivery type of order. You do not have to enter a driver's name if you aren't sure of the driver while taking the order. 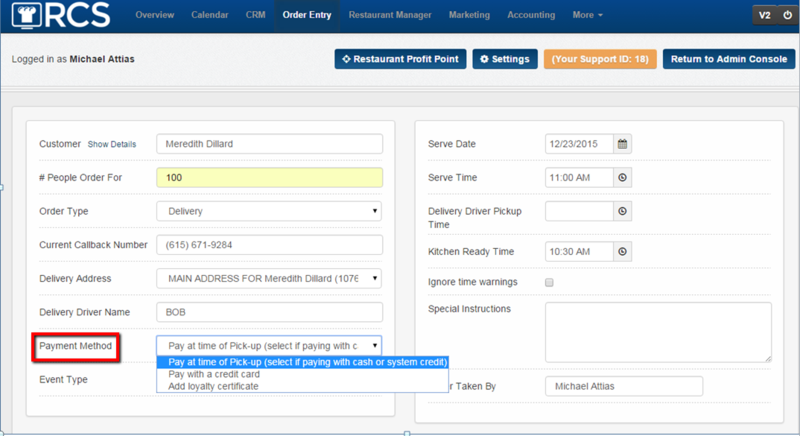 You can assign a delivery driver via the Delivery Report at a later time. 7. The next field is the Payment Method field. 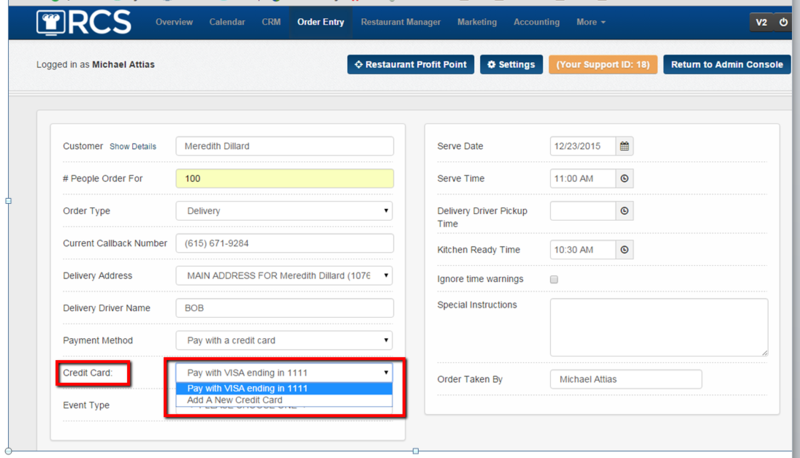 Please click on the Drop Down box to see the types of payment methods your restaurant offers. ***8. 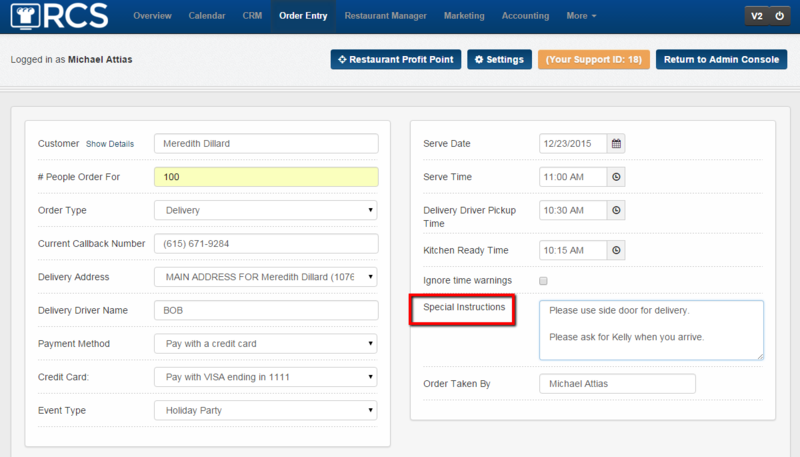 If the payment method chosen was Credit Card then the cards that the client has stored in their CRM page will appear. If you need to a new card please choose Add A New Credit Card. Only the type of credit card and the last 4 digits will appear. 9. The next field is Event Type. Please select the Drop Down and select the reason the customer is placing the order. This will allow you to pull up a report to see your sales by event type for analysis purposes. If you do not see your event type there is a way to add custom event types. Please see the article entitled How To Add A Custom Event Type. 10. The next field is the Serve Date field. 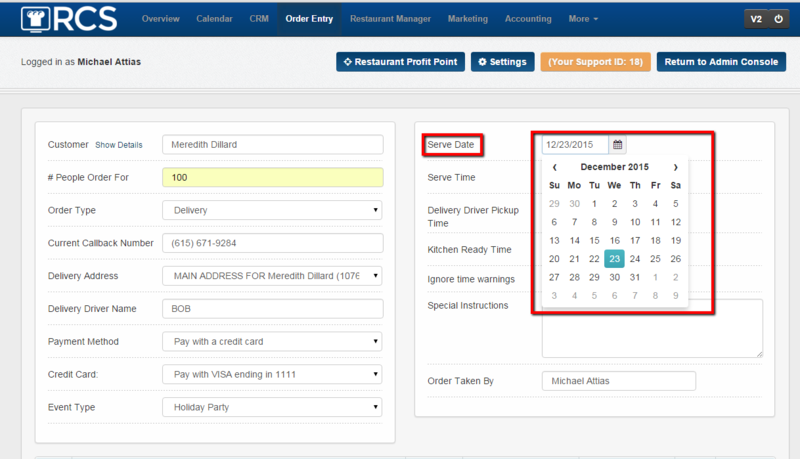 By clicking in this field a calendar will appear for you to choose the date of the order. 11. The next field is Serve Time. This is the time that customer would like to have the food ready to be eaten by. So this means that if it is a delivery the food has been delivered and set up and is ready for the clients to enjoy. Or if the client is picking up the order then this is when the client is expected to be at the restaurant to pick up the order. Clicking the Clock icon will allow you to choose the time or you can highlight the time and manually type in. ****12. If the order is for delivery the next field that will appear is the Delivery Driver Pickup Time. This is the time that the driver who is delivering the order needs to be at the restaurant to have the order to the delivery location in plenty of time. Clicking the Clock icon will allow you to choose the time or you can highlight the time and manually type in. 13. The next field is the Kitchen Ready Time. 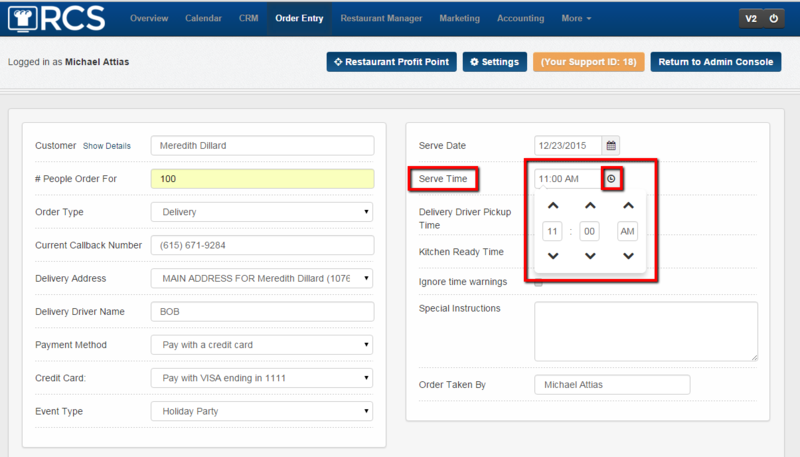 This field is the time that the kitchen needs to have the food completely ready by of either the driver to deliver the food or for the customer to pick up. Clicking the Clock icon will allow you to choose the time or you can highlight the time and manually type in. 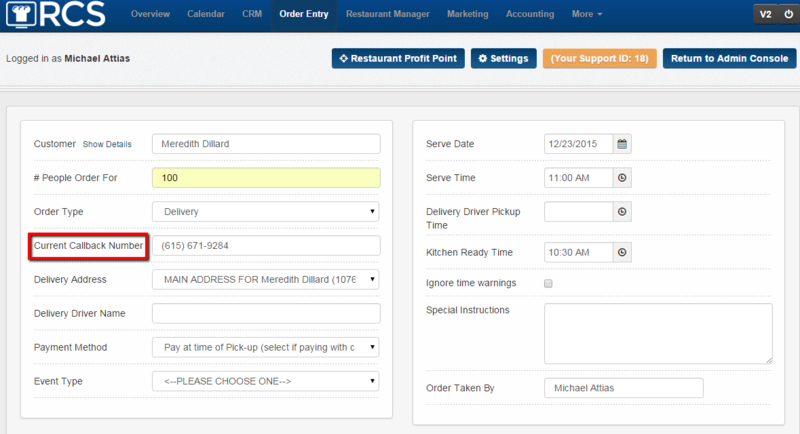 A - place an order outside your business hours. B - place an order on a day that you are closed on. 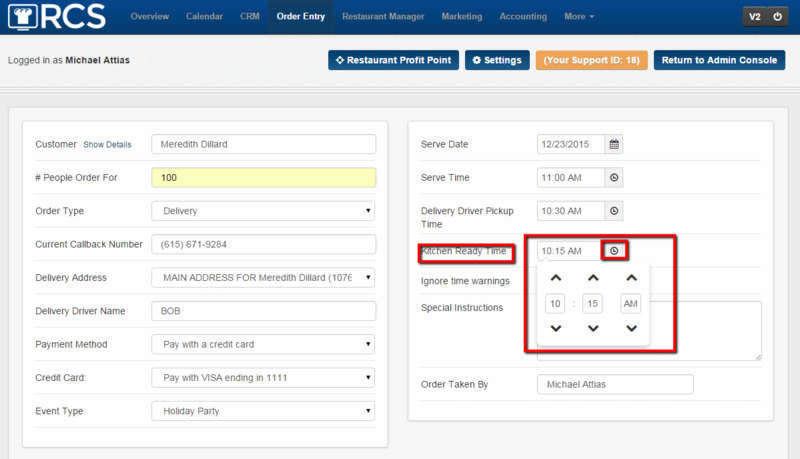 C - place an order for a date that has already past (so if you forgot to add an order you can go back in and add it later for the correct date). 15. The next field is Special Instructions. 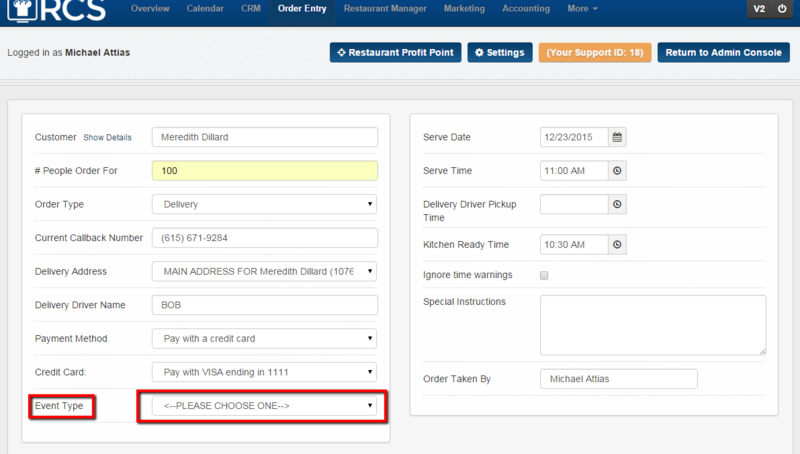 This field will allow you to type in some additional information that you need to know about the order but does not pertain to the menu items being order. 16. The last field is the Order Taken By field. This field will be automatically filled in with the name of the employee that is logged in. You can override this field if you need too. *We do not recommend using the same log in for all employees. We encourage you to set up an Username and Password for each employee.